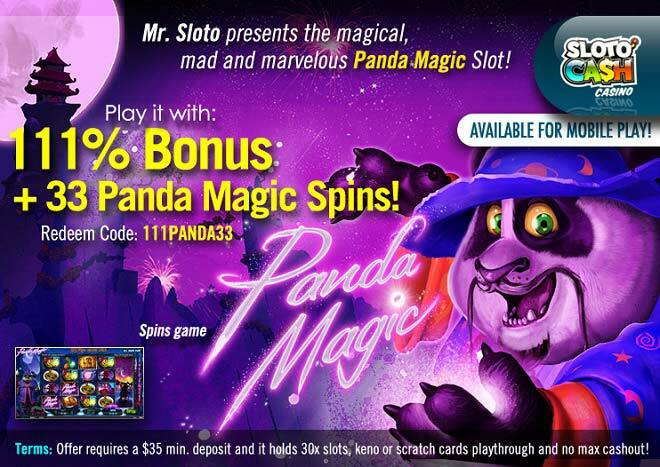 Mr. Sloto has a new trick up his sleeve and it’s called Panda Magic. Deposit a minimum of $35 and you’ll be conjuring some major winnings from your desktop or mobile with a 111% Bonus and 33 FREE Panda Magic Spins! This is a 5 reel and 20 payline slot game with a magical motif, featuring bright and bold graphics and many enjoyable features that quickly turn into wins. The main theme of this fantastic slot game comes to life when a mystical Chinese creature – that happens to be a panda – waves his magical wand and turns Wild symbols into expanding icons for more winning opportunities! Magic continues to happen with the help of symbols such as the wizard’s hat, a mushroom, an owl, a Chinese castle, a crystal ball and, of course, a book of spells. Whenever the scatter Magic Ticker appears you’ll be awarded free spins that go as high as 30 with prizes multiplied times two. Moreover, during the free spins round, the “More Magic” feature can be triggered when 3 ore more of the Panda Magic symbols are landed. Additional Wilds will come into play producing even more magical wins!